5-fluorouracil (5-FU) has been widely used for the treatment of tumors. Regardless of its widespread use as an anti-cancer drug, 5-FU therapy can cause several side effects, including developmental toxicity and neurotoxicity. However, the potential action of 5-FU at the early fetal stage has not yet been completely elucidated. In the present study, we investigated the effect of 5-FU exposure on neural induction, using human induced pluripotent stem cells (iPSCs) as a model of human fetal stage. 5-FU exposure reduced the expression of several neural differentiation marker genes, such as OTX2, in iPSCs. Since the neural differentiation process requires ATP as a source of energy, we next examined intracellular ATP content using iPSCs. 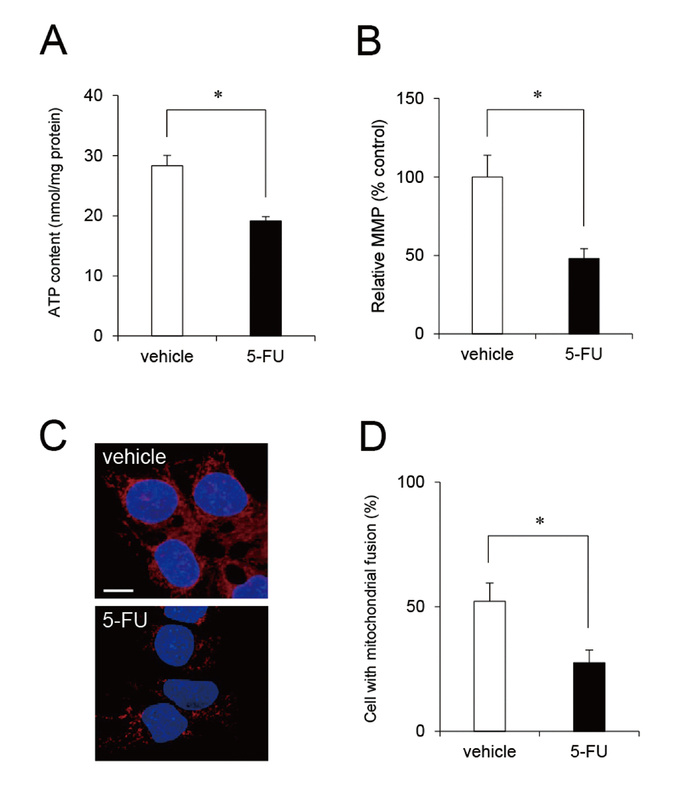 We found that 5-FU decreased intracellular ATP levels in iPSCs. We further focused on the effects of 5-FU on mitochondrial dynamics, which plays a role of ATP production. We found that 5-FU induced mitochondrial fragmentation and reduced the level of mitochondrial fusion proteins, mitofusin 1 and 2 (Mfn1/2). Double knockdown of Mfn1/2 genes in iPSCs downregulated the gene expression of OTX2, suggesting that Mfn mediates neural differentiation in iPSCs. Taken together, these results indicate that 5-FU has a neurotoxicity via Mfn-mediated mitochondria dynamics in iPSCs. Thus, mitochondrial dysfunction in iPSCs could be used as a possible marker for cytotoxic effects of drugs. Growing evidence suggests the involvement of industrial chemicals and drugs, including anticancer pharmaceuticals, in neurodevelopmental disorder, such as learning disabilities, attention deficit hyperactivity disorder, cognitive impairment, autism, and teratogenicity (Robaey et al., 2008; Ouzir et al., 2016). Compared to the adult brain, the fetal brain is inherently more susceptible to compound-induced toxicity (Rodier, 1995). Thus, exposure to these substances during early development may lead to adverse neurological effects manifested at a later phase of life (Rice and Barone, 2000). Anti-cancer drugs, such as 5-fluorouracil (5-FU), have been widely used for chemotherapy to treat many types of solid tumors (Ha et al., 2011). Nevertheless, there is an increasing concern regarding the side effects of 5-FU. Several reports indicate that 5-FU cause developmental neurotoxicity in rats. For example, in developing brain of rat fetuses intraperitoneally injected with 5-FU, distorted architectures were observed in cerebral cortex, hippocampus, olfactory cortex, and cerebrum (Kumar et al., 2005). After female pregnant rats were treated with 5-FU, gross defects in the developing brain were observed in their fetuses (Kumar et al., 2006). However, the effect of 5-FU on the neurodevelopment at human fetal stage remains to be precisely elucidated. Mitochondria continuously change morphology through fission and fusion (Youle and van der Bliek, 2012; van der Bliek et al., 2013). These mitochondrial dynamics are an important quality control mechanism that maintains mitochondrial functions, including energy generation. Mitochondrial fission and fusion are regulated by several GTPases. In mitochondrial fission, dynamin-related protein 1 (Drp1) is a cytoplasmic protein that assembles into rings surrounding the outer mitochondrial membrane, where it interacts with fission protein 1 (Fis1) to promote fission (Smirnova et al., 2001; Yoon et al., 2003). In contrast, mitofusin 1 and 2 (Mfn1 and Mfn2) and optic atrophy 1 (Opa1) induce the fusion of the outer and inner mitochondrial membranes, respectively (Cipolat et al., 2004; Koshiba et al., 2004). Mfn1 and Mfn2 knockout mice demonstrated a developmental delay at the mid-gestational embryonic stage, ultimately leading to their death (Chen et al., 2003). Moreover, cells from these embryos contain fragmented and dysfunctional mitochondria. We previously reported that Mfn1 knockdown (KD) inhibited neural induction through mitochondrial dysfunction, such as mitochondrial fragmentation and decreased ATP levels, in human iPSCs (Yamada et al., 2017). In the present study, we investigated the effect of 5-FU on neural differentiation using human induced pluripotent stem cells (iPSCs) as a model of human fetal stage. We focused on the effects of 5-FU on mitochondrial dynamics, and examined the molecular mechanisms of the process. Our results demonstrated that 5-FU inhibited ATP production through Mfn1/2 reduction, followed by mitochondrial fragmentation. 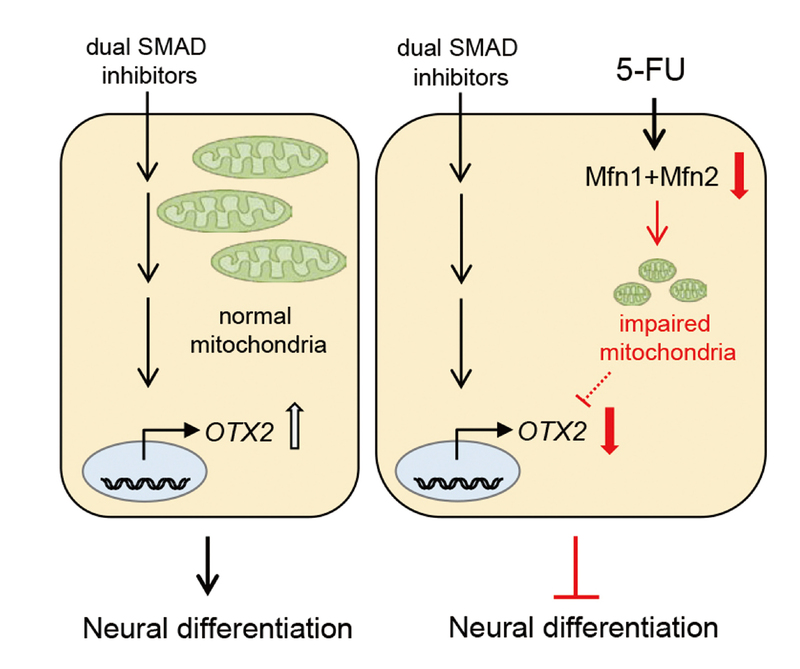 Moreover, 5-FU-mediated mitochondrial dysfunction inhibited neural induction by decreasing the level of OTX2, which is a marker of neurogenesis. These results suggest that 5-FU-induced neurodevelopmental toxicity is based on the impairment of mitochondrial functions in human iPSCs. 5-FU was obtained from Enzo Life Sciences (Farmingdale, NY, USA). 2-mercaptoethanol (2-ME) was obtained from Sigma-Aldrich (St. Louis, MO, USA). Dimethylsulfoxide (DMSO), Y-27632, SB431542, and LDN193189 were obtained from Wako (Tokyo, Japan). Penicillin-streptomycin mixture (PS) was obtained from Thermo Fisher Scientific (Waltham, MA, USA). All other reagents were of analytical grade and obtained from commercial sources. The human iPSC line 253G1 (Riken BRC Cell Bank, Tsukuba, Ibaraki, Japan) was established through retroviral transduction of OCT4, SOX2, and KLF4 into adult human dermal fibroblasts (Nakagawa et al., 2008). The cells were cultured under feeder-free conditions, using human embryonic stem cell (ESC)-qualified Matrigel (BD Biosciences, San Jose, CA, USA) and TeSR-E8 medium (Stemcell Technologies, Vancouver, BC, Canada), at 37°C, in an atmosphere containing 5% CO2. For passage, iPSC colonies were dissociated into single cells using Accumax (Innovative Cell Technologies, San Diego, CA, USA) and cultured in TeSR-E8 medium. To induce the neuronal lineages, the dual SMAD inhibition protocol was used as previously described with modifications (Chambers et al., 2009). Briefly, iPSC colonies were dissociated into single cells using Accumax. The cells were seeded at a density of 7 × 104 cells/cm2 in TeSR-E8 medium on Matrigel-coated plates in order to reach nearly confluent within 2 days after seeding. The initial differentiation medium was knockout serum replacement (KSR) medium [Knockout DMEM (Thermo Fisher Scientific) containing KSR (Thermo Fisher Scientific), L-glutamine, NEAA, 2-ME, PS] with SB431542 (TGFβ inhibitor, 10 μM), and LDN193189 (BMP inhibitor, 1 μM). After 4 days, N2 medium [Neurobasal containing N2, B27, GlutaMAX, PS] was added to the KSR medium with LDN193189 every 2 days. Cell staining was performed as previously described (Hirata et al., 2014). Cells, cultured on glass coverslips, were fixed in 4% paraformaldehyde in PBS (pH 7.4) for 15 min at room temperature. The fixed cells were incubated with anti-PAX6 polyclonal antibodies (1:100; Biolegend, San Diego, CA, USA) overnight at 4°C. Finally, they were incubated with Alexa594-conjugated secondary antibodies (1:200; Life Technologies) for 1 hr at room temperature. The cells were enclosed in SlowFade (Life Technologies) and examined using a BIOREVO BZ-9000 fluorescent microscope (Keyence, Osaka, Japan). Intracellular ATP content was measured using an ATP Determination Kit (Thermo Fisher Scientific), as previously described (Yamada et al., 2016). Briefly, the cells were washed and lysed with 0.1% Triton X-100/PBS. The resulting cell lysates were added to a reaction mixture containing 0.5 mM D-luciferin, 1 mM DTT, and 1.25 μg/mL luciferase, and incubated for 30 min at room temperature. Luminescence was measured using a Fluoroskan Ascent FL microplate reader (Thermo Fisher Scientific). The luminescence intensities were normalized to the total protein content. A Cell Meter JC-10 Mitochondrial Membrane Potential Assay Kit (AAT Bioquest, Sunnyvale, CA, USA) was used to detect MMP, as previously reported (Yamada et al., 2016). Briefly, the cells were suspended in staining buffer containing JC-10 and incubated for 20 min at room temperature. After the cells were treated with 5-FU, a FACS Aria II cell sorter (BD Biosciences) was used to measure the fluorescence intensity ratio, JC-aggregate (F-590)/JC-monomer (F-535). Following the 5-FU treatment (1 μM, 72 hr), the cells were fixed with 4% paraformaldehyde and stained with 50 nM MitoTracker Red CMXRos (Cell Signaling Technology, Danvers, MA, USA) and 5 μg/mL Hoechst 33342 (Sigma-Aldrich). Changes in mitochondrial morphology were observed using a confocal laser microscope (Nikon A1). Images (n = 5) of random fields were acquired and the number of cells displaying mitochondrial fusion (< 10% punctiform) was determined in each image, as previously reported (Fan et al., 2010). RT-PCR was performed as previously reported (Asanagi et al., 2016; Hirata et al., 2017). Briefly, total RNA was isolated from iPSCs using TRIzol reagent (Thermo Fisher Scientific). Quantitative real-time reverse transcription (RT)-PCR was performed using a QuantiTect SYBR Green RT-PCR Kit (Qiagen, Valencia, CA, USA), with an ABI PRISM 7900HT sequence detection system (Applied Biosystems, Foster City, CA, USA). Relative changes in transcript levels were normalized to the mRNA levels of glyceraldehyde-3-phosphate dehydrogenase (GAPDH). The following primer sequences were used for real-time PCR analysis: Mfn1, forward, 5′-GGCATCTGTGGCCGAGTT-3′ and reverse, 5′-ATTATGCTAAGTCTCCGCTCCAA-3′; Mfn2, forward, 5′-GCTCGGAGGCACATGAAAGT-3′ and reverse, 5′-ATCACGGTGCTCTTCCCATT-3′; Opa1, forward, 5′-GTGCTGCCCGCCTAGAAA-3′ and reverse, 5′-TGACAGGCACCCGTACTCAGT-3′; Fis1, forward, 5′-TACGTCCGCGGGTTGCT-3′ and reverse, 5′-CCAGTTCCTTGGCCTGGTT-3′; Drp1, forward, 5′-TGGGCGCCGACATCA-3′ and reverse, 5′-GCTCTGCGTTCCCACTACGA-3′; OTX2, forward, 5′- ACAAGTGGCCAATTCACTCC-3′ and reverse, 5′-GAGGTGGACAAGGGATCTGA-3′; PAX6, forward, 5′-ATGTGTGAGTAAAATTCTGGGCA-3′ and reverse, 5′-GCTTACAACTTCTGGAGTCGCTA-3′; FOXG1, forward, 5′-GCCACAATCTGTCCCTCAACA-3′ and reverse, 5′-GACGGGTCCAGCATCCAGTA-3′; NCAM1, forward, 5′-GGCATTTACAAGTGTGTGGTTAC-3′ and reverse, 5′-TTGGCGCATTCTTGAACATGA-3′; Nanog, forward, 5′-CAGAAGGCCTCAGCACCTAC-3′ and reverse, 5′-ATTGTTCCAGGTCTGGTTGC-3′; Oct-4, forward, 5′-ACATCAAAGCTCTGCAGAAAGAA-3′ and reverse, 5′-CTGAATACCTTCCCAAATAGAACCC-3′; Sox2, forward, 5′-AACCCCAAGATGCACAACTC-3′ and reverse, 5′-GCTTAGCCTCGTCGATGAAC-3′; GAPDH, forward, 5′-GTCTCCTCTGACTTCAACAGCG-3′ and reverse, 5′-ACCACCCTGTTGCTGTAGCCAA-3′. Western blot analysis was performed as previously reported (Kanda et al., 2011). Briefly, the cells were lysed with Cell Lysis Buffer (Cell Signaling Technology). The proteins were then separated using sodium dodecyl sulfate-polyacrylamide gel electrophoresis and electrophoretically transferred to Immobilon-P membranes (Millipore, Billerica, MA, USA). The membranes were probed with anti-Mfn1 polyclonal antibodies (1:1000; Cell Signaling Technology), anti-Mfn2 monoclonal antibodies (1:1000; Cell Signaling Technology), anti-Opa1 monoclonal antibodies (1:1000; BD Biosciences), anti-Fis1 polyclonal antibodies (1:200; Santa Cruz Biotechnology, Santa Cruz, CA, USA), anti-Drp1 monoclonal antibodies (1:1000; Cell Signaling Technology), and anti-β-actin monoclonal antibodies (1:5000; Sigma-Aldrich). The membranes were then incubated with secondary antibodies against rabbit or mouse IgG conjugated to horseradish peroxidase (Cell Signaling Technology). The bands were visualized using an ECL Western Blotting Analysis System (GE Healthcare, Buckinghamshire, UK). Images were acquired using an LAS-3000 Imager (Fujifilm, Tokyo, Japan). Double-stranded RNA oligonucleotides (siRNAs) against Mfn1 and Mfn2, and appropriate control scrambled siRNA were purchased from Life Technologies. The siRNAs were transfected into iPSCs using DharmaFECT1 (Dharmacon, Lafayette, CO, USA) as previously described (Kinehara et al., 2013). All data are presented as mean ± standard deviation (SD). An analysis of variance (ANOVA) followed by post-hoc Bonferroni test was used to analyze data in Fig. 1B, 4A, 4B, and 4D. A Student’s t-test was used to analyze data in Fig. 1C, 1E, 1F, 2, 3, and 4C. Statistical significance was set at P < 0.05. Time course studies of neural induction in iPSCs exposed to 5-FU. (A) Schematic time course of neural induction from iPSCs. Neural induction was initiated after exposure to 5-FU for 24 hr (day 0). (B) At day 2 after neural induction with 5-FU (0-3 μM), OTX2 expression was examined using real-time PCR analysis. (C, D) At day 4 after neural induction with 5-FU (1 μM), PAX6 expression was examined by real-time PCR and immunocytochemistry. Nuclei were counterstained with DAPI. Bar = 100 μm. (E, F) At days 6 and 8, expression of FOXG1 and NCAM1 was examined using real-time PCR analysis. Data are represented as means ± standard deviation (S.D. ; n = 3). *P < 0.05. Mitochondrial function of iPSCs exposed to 5-FU. (A) Cells were exposed to 5-FU (1 μM) for 24 hr. The intracellular ATP content was determined by the luciferase assay (n = 3). (B) Cells were exposed to 5-FU for 72 hr and stained with JC-10 for 20 min. MMP of JC-10 labeled cells was analyzed by flow cytometry. The histogram represents the ratio of JC-aggregate (F-590) to JC-monomer (F-535) fluorescence (n = 3). (C) After exposure to 5-FU for 72 hr, the cells were stained with MitoTracker Red CMXRos and Hoechst33342. Mitochondrial morphology was observed using confocal laser microscopy. Bar = 10 μm. (D) The number of cells with mitochondrial fusion was determined (n = 5). Data are represented as means ± S.D. *P < 0.05. Expression of mitochondrial fission and fusion factors of iPSCs exposed to 5-FU. (A) After exposure to 5-FU (1 μM) for 72 hr, expression of mitochondrial genes was analyzed using real-time PCR. (B) After exposure to 5-FU for 72 hr, expression of mitochondrial proteins was analyzed using western blotting. (C) Relative densities of bands were quantified using ImageJ software. Relative changes in expression were determined by normalization to β-actin. Data are represented as mean ± S.D. (n = 3). *P < 0.05. Effect of Mfn1/2 double knockdown on neural induction of iPSCs. Cells were transfected with siRNAs against Mfn1 and Mfn2 or a scrambled siRNA (control) for 48 hr. (A) The expression of Mfn1 and Mfn2 genes was analyzed by real-time PCR. (B) The expressions of Mfn1 and Mfn2 proteins were analyzed using western blotting. Relative densities of bands were quantified using ImageJ software. The relative changes in expression were determined by normalization to β-actin. (C) Intracellular ATP content was determined by the luciferase assay. (D) After neural induction, the expressions of neural differentiation markers OTX2 (day 2), PAX6 (day 4), FOXG1 (day 6), and NCAM1 (day 8) were examined using real-time PCR. Data are represented as mean ± S.D. (n = 3). *P < 0.05. In order to investigate whether 5-FU affects early neurodevelopment at an embryonic stage, we examined the effect of 5-FU on neural differentiation capability of iPSCs, which was induced with a dual SMAD inhibition protocol (Chambers et al., 2009) (Fig. 1A). We used DMSO as vehicle control. First, the expression of OTX2, a neuroectodermal marker that regulates neurogenesis (Mortensen et al., 2015), was analyzed using real-time PCR on day 2 after neural induction with different concentrations of 5-FU. Compared to the vehicle control, we found that exposure to more than 1 μM 5-FU reduced OTX2 gene expression by over 50% (Fig. 1B). Thus, we used 5-FU at 1 μM in the following experiments. Next, we examined the expression of several neural differentiation markers at days 4, 6, and 8 after exposure to 1 μM 5-FU. Real-time PCR analysis revealed that 5-FU greatly reduced the expression of PAX6, another neuroectodermal marker (Manuel et al., 2015), by day 4 (Fig. 1C), which was immunocytochemically confirmed by a loss of PAX6-positive cells treated with 5-FU (Fig. 1D). We further found that 5-FU decreased the expression of FOXG1 (day 6, neuroectodermal marker) (Shen et al., 2006) and NCAM1 (day 8, neural marker) (Polo-Parada et al., 2004) by real-time PCR analysis (Fig. 1E, F, respectively). In contrast, the expression levels of stem cell marker genes, such as Nanog, Oct-4 and Sox2, were not affected after exposure to 5-FU in iPSCs (Fig. S1). 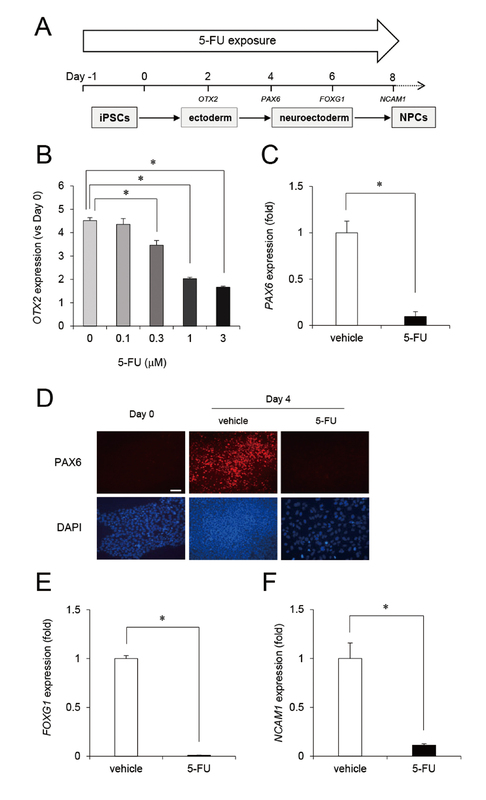 These data suggest that 5-FU has an inhibitory effect on early neural differentiation of iPSCs. Since the neural differentiation process requires ATP as a source of energy (Cheng et al., 2010), we examined intracellular ATP content in iPSCs. Treatment with 1 μM 5-FU significantly reduced the ATP content of the cells (Fig. 2A). Since 5-FU decreased ATP, which is produced in the mitochondria, we focused on several mitochondrial functions. 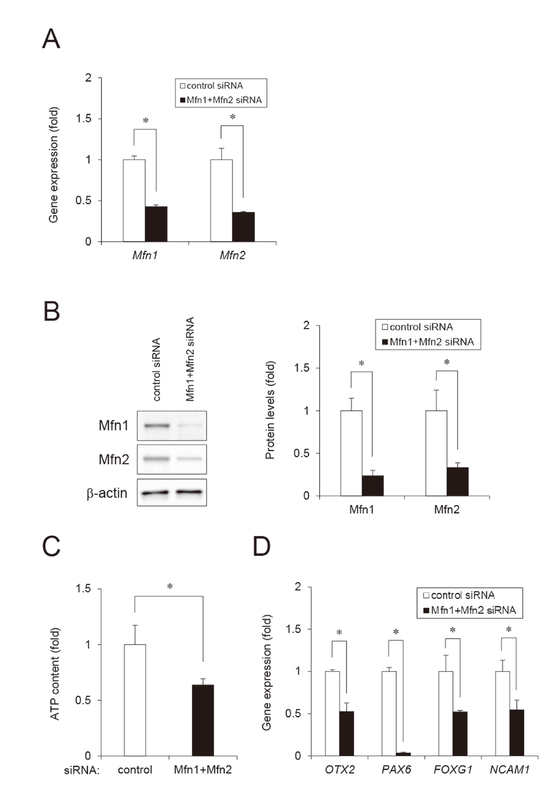 Mitochondrial membrane potential (MMP) was decreased by exposure to 1 μM 5-FU (Fig. 2B). In addition, exposure to 5-FU increased the number of cells with fragmented mitochondria displaying punctate morphology (Fig. 2C) and decreased the number of cells exhibiting mitochondrial fusion (Fig. 2D). These results suggest that 5-FU induces mitochondrial dysfunction, including MMP depolarization and mitochondrial fragmentation, in iPSCs. To examine the molecular mechanisms by which 5-FU induces mitochondrial fragmentation in iPSCs, we assessed the expression levels of mitochondrial fusion (Mfn1, Mfn2, and OPA1) and fission genes (Fis1 and Drp1). Real-time PCR analysis showed that the gene expression of the factors was not altered after exposure to 5-FU (Fig. 3A). 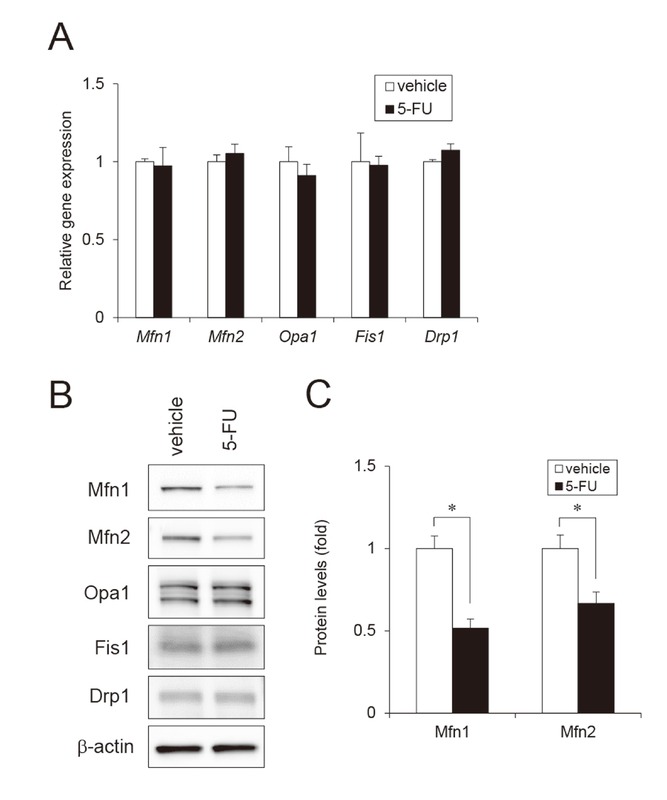 Interestingly, western blot analysis revealed that 5-FU significantly decreased Mfn1/2 protein levels. In contrast, protein expression levels of other factors were not changed (Fig. 3B, C). These results suggest that 5-FU reduces Mfn1/2 protein levels and weakens daughter mitochondrial fusion activities, which leads to mitochondrial fragmentation. To investigate the role of Mfn1/2 in the effects of 5-FU on neural induction, we performed double KD of Mfn1/2, using siRNA. Real-time PCR analysis demonstrated that the efficiency of double KD was approximately 57% (for Mfn1) and 64% (for Mfn2) (Fig. 4A). The double KD effects were also confirmed by protein levels (Fig. 4B). To confirm the effect of Mfn1/2 KD on mitochondrial function, we examined intracellular ATP content in Mfn1/2 KD cells. Mfn1/2 KD significantly reduced the ATP content of the cells (Fig. 4C). The Mfn1/2 KD cells were used to perform neural induction. Real-time PCR analysis revealed that Mfn1/2 KD decreased the expression of OTX2 (day 2), PAX6 (day 4), FOXG1 (day 6), and NCAM1 (day 8) (Fig. 4D). These data suggest that Mfn is involved in 5-FU-mediated negative effects on the neural induction of iPSCs. In the present study, we demonstrated that exposure to 5-FU targeted mitochondrial quality control in human iPSCs. We showed that 5-FU induced a reduction in Mfn1/2, thereby promoting mitochondrial fragmentation and ATP reduction. We further demonstrated that 5-FU suppressed neural induction by decreasing levels of OTX2. Since Mfn1/2 double KD also inhibited the neural induction by downregulating OTX2, the negative effect of 5-FU on neural differentiation could be mediated by mitochondrial dysfunction via Mfn1/2 reduction. Fig. 5 shows a proposed mechanism of 5-FU neurotoxicity. Proposed mechanism of 5-FU neurotoxicity in human iPSCs. Exposure to 5-FU causes Mfn1/2 reduction, which induces mitochondrial dysfunction, including mitochondrial fragmentation and decreased ATP levels. Mitochondrial dysfunction in turn leads to the suppression of OTX2. We found that 1 μM 5-FU caused developmental neurotoxicity in human iPSCs (Fig. 1). Since it has been reported that the plasma 5-FU concentration in patients with carcinoma varies from 0.192 μM to 192 μM (Findlay et al., 1996), observations made using micromolar 5-FU levels in iPSCs could potentially reflect the biological reactions of a living body receiving medical treatment. Thus, our assay system using cells differentiated from iPSCs would be useful to evaluate developmental neurotoxicity of drugs. Further research using human iPSCs is warranted to investigate whether other drugs, including anticancer pharmaceuticals, can also affect neurodevelopment. We showed that 5-FU induced mitochondrial fragmentation via the reduction of Mfn1/2 (Fig. 2, 3). Consistent with this finding, our double KD studies indicated that the reduction of Mfn1/2 was sufficient to promote mitochondrial dysfunction. 5-FU-induced Mfn1/2 reduction might mediate mitochondrial fragmentation, decrease ATP levels, and cause iPSC cytotoxicity. We previously reported that organotin compounds, such as tributyltin (TBT), specifically reduced Mfn1, but not Mfn2, in iPSCs (Yamada et al., 2016). Moreover, we reported that this apparent TBT specificity for Mfn1 was dependent on proteosomal degradation by E3 ubiquitin ligase membrane-associated RING-CH 5 (MARCH5) (Yamada et al., 2016). Among all mitochondrial proteins, MARCH5 could selectively bind to Mfn1, depending on its acetylation, and degrade it (Park et al., 2014). Other E3 ubiquitin ligase Parkin is known to degrade both Mfn1 and Mfn2 (Tanaka et al., 2010), independently of the autophagy pathway (Chan et al., 2011). Further research is required to determine whether 5-FU reduces Mfn1/2 via E3 ubiquitin ligase, including Parkin, in iPSCs. We further demonstrated that Mfn1/2 reduction mediated neurotoxic effects of 5-FU on iPSCs via OTX2 downregulation (Fig. 1-4). PAX6 and FOXG1 were downregulated, along with OTX2, during neural differentiation of iPSCs that were exposed to 5-FU. These genes act as transcriptional regulators during forebrain development in vertebrates (Danesin and Houart, 2012; Georgala et al., 2011). Targeted disruption of these genes in rodents led to the loss of anterior neural tissues, suggesting a central role in forebrain development (Tuoc et al., 2009; Tian et al., 2012). 5-FU causes developmental defects in the hippocampus of rodents (Kumar et al., 2005). 5-FU may affect the architecture of forebrain regions, such as the hippocampus and cortex, due to the transcriptional silencing of anterior neural markers during early neurogenesis. In addition, NCAM1 was also downregulated during neural differentiation of iPSCs exposed to 5-FU. Thus, further studies using neural progenitor cells are required to reveal how 5-FU affects neural maturation processes. In summary, our results demonstrate a novel mechanism underlying cytotoxicity, including neurodevelopmental toxicity of 5-FU in iPSCs. Significant progress was recently made in inducing the differentiation of pluripotent stem cells into a variety of cell types. More research is required to evaluate the developmental effects of 5-FU on various types of iPSC-derived cells (Li et al., 2016). This 5-FU-induced cytotoxicity was likely caused by Mfn-mediated mitochondrial dysfunction. We previously found that Mfn1 was involved in the cytotoxicities of several chemicals, like chlorpyrifos, nicotine, and tributyltin (Hirata et al., 2016; Yamada et al., 2016, 2017). Thus, mitochondrial functions influenced by Mfn might be a good starting point for investigating toxic mechanisms induced by exposure to chemicals and drugs. This work was supported by a Health and Labour Sciences Research Grant from the Ministry of Health, Labour, and Welfare, Japan (#H25-Kagaku-Ippan-002 and H28-Kagaku-Ippan-003 to Y. Kanda), a Grant-in-Aid for Scientific Research from the Ministry of Education, Culture, Sports, Science, and Technology, Japan (#26293056 and #26670041 to Y. Kanda, #17K00576 to S. Yamada), the Research on Regulatory Harmonization and Evaluation of Pharmaceuticals, Medical Devices, Regenerative and Cellular Therapy Products, Gene Therapy Products, and Cosmetics from Japan Agency for Medical Research and Development, AMED (JP17mk0104027 to Y. Kanda), and a grant from the Smoking Research Foundation (Y. Kanda). Asanagi, M., Yamada, S., Hirata, N., Itagaki, H., Kotake, Y., Sekino, Y. and Kanda, Y. (2016): Tributyltin induces G2/M cell cycle arrest via NAD(+)-dependent isocitrate dehydrogenase in human embryonic carcinoma cells. J. Toxicol. Sci., 41, 207-215. Chambers, S.M., Fasano, C.A., Papapetrou, E.P., Tomishima, M., Sadelain, M. and Studer, L. (2009): Highly efficient neural conversion of human ES and iPS cells by dual inhibition of SMAD signaling. Nat. Biotechnol., 27, 275-280. Chan, N.C., Salazar, A.M., Pham, A.H., Sweredoski, M.J., Kolawa, N.J., Graham, R.L., Hess, S. and Chan, D.C. (2011): Broad activation of the ubiquitin-proteasome system by Parkin is critical for mitophagy. Hum. Mol. Genet., 20, 1726-1737. Cheng, A., Hou, Y. and Mattson, M.P. (2010): Mitochondria and neuroplasticity. ASN Neuro, 2, e00045. Chen, H., Detmer, S.A., Ewald, A.J., Griffin, E.E., Fraser, S.E. and Chan, D.C. (2003): Mitofusins Mfn1 and Mfn2 coordinately regulate mitochondrial fusion and are essential for embryonic development. J. Cell Biol., 160, 189-200. Cipolat, S., Martins de Brito, O., Dal Zilio, B. and Scorrano, L. (2004): OPA1 requires mitofusin 1 to promote mitochondrial fusion. Proc. Natl. Acad. Sci. USA, 101, 15927-15932. Danesin, C. and Houart, C. (2012): A Fox stops the Wnt: implications for forebrain development and diseases. Curr. Opin. Genet. Dev., 22, 323-330. Fan, X., Hussien, R. and Brooks, G.A. (2010): H2O2-induced mitochondrial fragmentation in C2C12 myocytes. Free Radic. Biol. Med., 49, 1646-1654. Findlay, M.P., Raynaud, F., Cunningham, D., Iveson, A., Collins, D.J. and Leach, M.O. (1996): Measurement of plasma 5-fluorouracil by high-performance liquid chromatography with comparison of results to tissue drug levels observed using in vivo 19F magnetic resonance spectroscopy in patients on a protracted venous infusion with or without interferon-alpha. Ann. Oncol., 7, 47-53. Georgala, P.A., Carr, C.B. and Price, D.J. (2011): The role of Pax6 in forebrain development. Dev. Neurobiol., 71, 690-709. Ha, J.H., Hwang, D.Y., Yu, J., Park, D.H. and Ryu, S.H. (2011): Onset of Manic Episode during Chemotherapy with 5-Fluorouracil. Psychiatry Investig., 8, 71-73. Hirata, N., Yamada, S., Asanagi, M., Sekino, Y. and Kanda, Y. (2016): Nicotine induces mitochondrial fission through mitofusin degradation in human multipotent embryonic carcinoma cells. Biochem. Biophys. Res. Commun., 470, 300-305. Hirata, N., Yamada, S., Shoda, T., Kurihara, M., Sekino, Y. and Kanda, Y. (2014): Sphingosine-1-phosphate promotes expansion of cancer stem cells via S1PR3 by a ligand-independent Notch activation. Nat. Commun., 5, 4806. Hirata, N., Yamada, S., Sekino, Y. and Kanda, Y. (2017): Tobacco nitrosamine NNK increases ALDH-positive cells via ROS-Wnt signaling pathway in A549 human lung cancer cells. J. Toxicol. Sci., 42, 193-204. Kanda, Y., Hinata, T., Kang, S.W. and Watanabe, Y. (2011): Reactive oxygen species mediate adipocyte differentiation in mesenchymal stem cells. Life Sci., 89, 250-258. Kinehara, M., Kawamura, S., Tateyama, D., Suga, M., Matsumura, H., Mimura, S., Hirayama, N., Hirata, M., Uchio-Yamada, K., Kohara, A., Yanagihara, K. and Furue, M.K. (2013): Protein kinase C regulates human pluripotent stem cell self-renewal. PLoS One, 8, e54122. Koshiba, T., Detmer, S.A., Kaiser, J.T., Chen, H., McCaffery, J.M. and Chan, D.C. (2004): Structural basis of mitochondrial tethering by mitofusin complexes. Science, 305, 858-862. Kumar, S., Das, J.K. and Pandey, S.K. (2005): Neuroembryotoxic effect of 5- Fluorouracil in rat: injecting in late phase of gestation. Nepal Med. Coll. J., 7, 83-86. Kumar, S., Lobo, S.W., Dubey, A.K. and Pandey, S.K. (2006): Teratogenic effects of 5-fluorouracil on rat brain. Nepal Med. Coll. J., 8, 7-8. Li, K., Kong, Y., Zhang, M., Xie, F., Liu, P. and Xu, S. (2016): Differentiation of pluripotent stem cells for regenerative medicine. Biochem. Biophys. Res. Commun., 471, 1-4. Manuel, M.N., Mi, D., Mason, J.O. and Price, D.J. (2015): Regulation of cerebral cortical neurogenesis by the Pax6 transcription factor. Front. Cell. Neurosci., 9, 70. Mortensen, A.H., Schade, V., Lamonerie, T. and Camper, S.A. (2015): Deletion of OTX2 in neural ectoderm delays anterior pituitary development. Hum. Mol. Genet., 24, 939-953. Nakagawa, M., Koyanagi, M., Tanabe, K., Takahashi, K., Ichisaka, T., Aoi, T., Okita, K., Mochiduki, Y., Takizawa, N. and Yamanaka, S. (2008): Generation of induced pluripotent stem cells without Myc from mouse and human fibroblasts. Nat. Biotechnol., 26, 101-106. Ouzir, M., El Bairi, K. and Amzazi, S. (2016): Toxicological properties of fenugreek (Trigonella foenum graecum). Food Chem. Toxicol., 96, 145-154. Park, Y.Y., Nguyen, O.T., Kang, H. and Cho, H. (2014): MARCH5-mediated quality control on acetylated Mfn1 facilitates mitochondrial homeostasis and cell survival. Cell Death Dis., 5, e1172. Polo-Parada, L., Bose, C.M., Plattner, F. and Landmesser, L.T. (2004): Distinct roles of different neural cell adhesion molecule (NCAM) isoforms in synaptic maturation revealed by analysis of NCAM 180 kDa isoform-deficient mice. J. Neurosci., 24, 1852-1864. Rice, D. and Barone, S. Jr. (2000): Critical periods of vulnerability for the developing nervous system: evidence from humans and animal models. Environ. Health Perspect., 108 (Suppl 3), 511-533. Robaey, P., Krajinovic, M., Marcoux, S. and Moghrabi, A. (2008): Pharmacogenetics of the neurodevelopmental impact of anticancer chemotherapy. Dev. Disabil. Res. Rev., 14, 211-220. Rodier, P.M. (1995): Developing brain as a target of toxicity. Environ. Health Perspect., 103 (Suppl 6), 73-76. Shen, L., Nam, H.S., Song, P., Moore, H. and Anderson, S.A. (2006): FoxG1 haploinsufficiency results in impaired neurogenesis in the postnatal hippocampus and contextual memory deficits. Hippocampus, 16, 875-890. Smirnova, E., Griparic, L., Shurland, D.L. and van der Bliek, A.M. (2001): Dynamin-related protein Drp1 is required for mitochondrial division in mammalian cells. Mol. Biol. Cell, 12, 2245-2256. Tanaka, A., Cleland, M.M., Xu, S., Narendra, D.P., Suen, D.F., Karbowski, M. and Youle, R.J. (2010): Proteasome and p97 mediate mitophagy and degradation of mitofusins induced by Parkin. J. Cell Biol., 191, 1367-1380. Tian, C., Gong, Y., Yang, Y., Shen, W., Wang, K., Liu, J., Xu, B., Zhao, J. and Zhao, C. (2012): Foxg1 has an essential role in postnatal development of the dentate gyrus. J. Neurosci., 32, 2931-2949. Tuoc, T.C., Radyushkin, K., Tonchev, A.B., Piñon, M.C., Ashery-Padan, R., Molnár, Z., Davidoff, M.S. and Stoykova, A. (2009): Selective cortical layering abnormalities and behavioral deficits in cortex-specific Pax6 knock-out mice. J. Neurosci., 29, 8335-8349.
van der Bliek, A.M., Shen, Q. and Kawajiri, S. (2013): Mechanisms of mitochondrial fission and fusion. Cold Spring Harb. Perspect. Biol., 5, a011072. Yamada, S., Asanagi, M., Hirata, N., Itagaki, H., Sekino, Y. and Kanda, Y. (2016): Tributyltin induces mitochondrial fission through Mfn1 degradation in human induced pluripotent stem cells. Toxicol. In Vitro, 34, 257-263. Yamada, S., Kubo, Y., Yamazaki, D., Sekino, Y. and Kanda, Y. (2017): Chlorpyrifos inhibits neural induction via Mfn1-mediated mitochondrial dysfunction in human induced pluripotent stem cells. Sci. Rep., 7, 40925. Yoon, Y., Krueger, E.W., Oswald, B.J. and McNiven, M.A. (2003): The mitochondrial protein hFis1 regulates mitochondrial fission in mammalian cells through an interaction with the dynamin-like protein DLP1. Mol. Cell. Biol., 23, 5409-5420. Youle, R.J. and van der Bliek, A.M. (2012): Mitochondrial fission, fusion, and stress. Science, 337, 1062-1065.